Our spacious wellness suite is equipped with a double bed and comfortable seating area. Furthermore, it contains a safe, flatscreen TV, mini bar (charged), climate control, coffee and tea making facilities and balcony. The bathroom, equipped with a dual massage jet shower, infrared sauna , bubble bath and separate toilet, makes this suite complete. We offer various extras to make your stay in our hotel even more pleasant. If you prefer to add one or more extras to your reservation, you can leave a message in the “comment field” of your booking. It is also possible to add an extra afterwards via your own account. Prices are without €2.30 euro residency tax p.p.p.n. Specially for a wedding night or an unforgettable overnight stay. 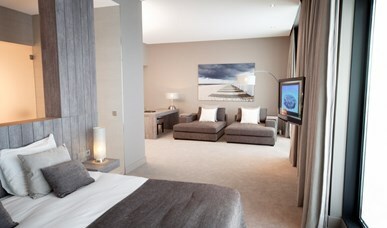 The bridal suite has a double bed and a spacious balcony. The large hot tub is situated in the centre of the room and there is a double washbasin and double walk-in shower. Lovely, bright suite with a beach theme. Features a double bed, a comfortable seating area and a balcony. The half open bathroom with a hot tub, walk-in shower and separate toilet means this suite has everything you need. 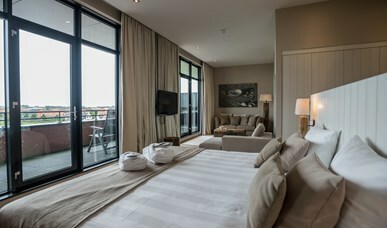 Zeeland = sea & beach, so in addition to the two beach suites, the hotel also has two sea suites. These also features a double bed, a comfortable seating area and a balcony. The half-open bathroom has a hot tub, walk-in shower and separate toilet. 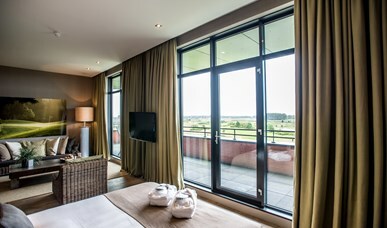 A suite with a golf theme and a beautiful view of the adjacent golf course. Facilities such as a double bed, comfortable seating area, balcony and half-open bathroom with a hot tub, walk-in shower and separate toilet.